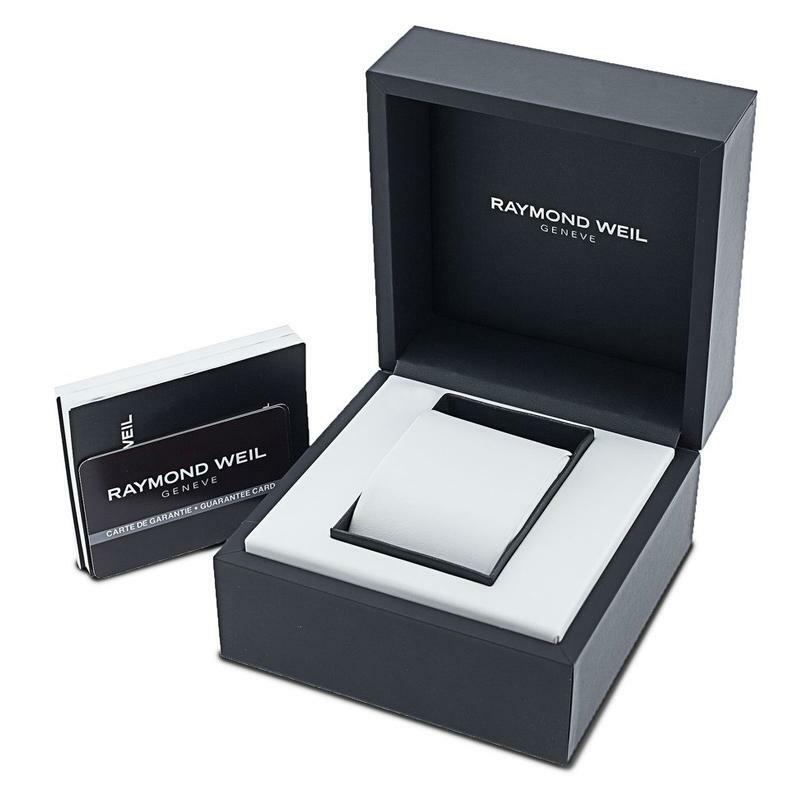 This authentic Raymond Weil timepiece comes complete with box, papers and 2 year manufacturers warranty. One only at this amazing price, SAVE £525!!! 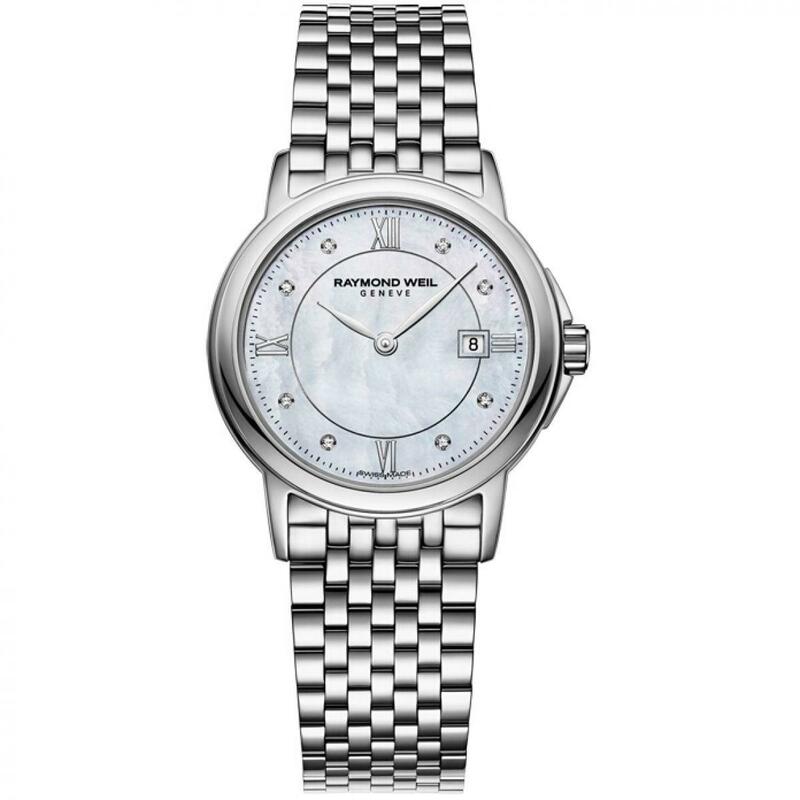 Designed with an effortlessly elegant style, this beautiful Raymond Weil Tradition diamond watch is a timeless classic. Fastened with a stainless steel bracelet with folding clasp and double push-security system, the 28mm stainless steel case is finished with a polished bezel which continues its sleek and curvaceous silhouette. Protected by sapphire crystal with antiglare treatment, the pretty white mother of pearl dial is studded with 8 glittering diamonds on the hour markers, bold silver tone Roman numerals at 3, 6, 9 and 12 o'clock and a date window at 3 o'clock. Water resistant to 50m, this stunning watch is powered by a precision quartz movement. Proving that beauty is not always fleeting, this gorgeous watch will transform any of your outfits into something special. The features of the watch include (among others) a date function. In regards to the water resistance, the watch has got a resistancy up to 50 metres. It means it can be submerged in water for periods, so can be used for swimming and fishing. It is not recommended for high impact water sports. In stock now and available for immediate dispatch.